The Elite Impulse is Elite’s flagship bow for 2016. This bow is a descendant of the very popular Elite Energy 32, Energy 35 and the Synergy. The Impulse has all of the proven design features that have made its predecessors so successful at the range and in the field. The Elite Impulse lineup features Elite’s Riser Cage technology ensuring riser strength and stiffness during the shot which results in improved accuracy. We at shootingtime.com really like this feature not only because of the increased riser strength, but the slots in the riser cage provided excellent holes for our backpack straps when we were Elk hunting in the Rocky Mountains of Colorado in 2014. The Elite Impulse’s cams deliver a smooth draw cycle while producing speeds that ensure tight pins and a flat arrow flight. These symmetrical cams are identical in weight and design ensuring even string payout and level nock travel. The Elite Impulse’s cams have interchangeable modules for different draw lengths as well as draw stops. The draw stops contact the limbs at full draw providing a rock solid back wall. The draw stops can be moved in the module’s draw stop slot to adjust draw length and let off. The Elite Impulse grip is one of the best grips on the market. Its narrow and smooth while it allows for solid torque free form when at full draw. Why would we point out that the offset style cable guard is one of the key features of this bow? It’s quite simple; with everyone going to the binary cam type of system, it leaves bow technicians very little room for tuning. Either the bow tunes well with proper form or it doesn’t. If, while paper tuning, a good rip is not accomplished, all a tech can do is mess with cam shims to alter the cant or lean of the cams. While you can change out the shims on the Elite Impulse lineup, you can also loosen and rotate the offset cable guard. This is quite useful when tuning a right handed bow with a left tear issue (or a left handed bow with a right tear issue). Other manufacturers have straight cable guards that do not allow for this adjustment. The Elite Impulse 34 is a solid performer. It’s smooth draw and exceptional speeds will make this bow one of the best sellers and performers in 2016. The feel of this bow throughout the draw cycle and shot are very satisfactory. We love the generous valley, rock solid back wall, quiet performance and blazing speeds. We think you’ll fall in love with this bow. We have not yet put this bow through paper, but if it’s as tunable as its predecessors, we don’t think we will run into any problems. If you’re looking to buy a new bow for 2016, this is one bow to try out. For more information, visit Elite’s website. Thanks to Strictly Archery of Shorewood, Illinois for providing us with the bow to use for review purposes. This bow is another solid performer by Elite Archery. Its excellent axle to axle length and performance makes this bow a joy to shoot. 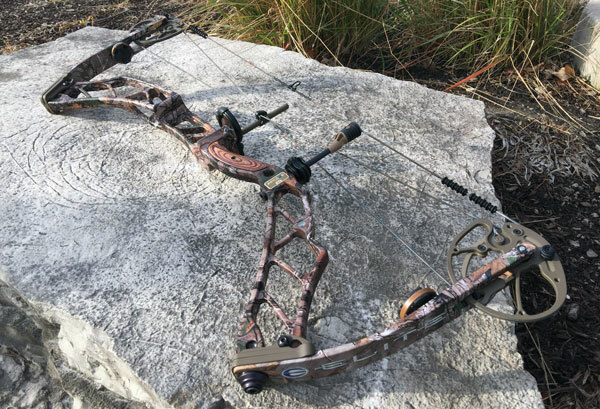 The rock solid riser, solid limbs, and an excellent cam system will guarantee that this bow will be a popular choice not only on the 3D course buy also in the field. I have owned the Impulse 31 in Verde for a 9 months now. This will be my first deer season with it. It is an awesome balance between speed and smooth draw. I’m surprised you didn’t mention the back wall and let-off. Wall is solid with adjustable dual limb stops that allow the user to customize the valley… deep and secure or right on the edge. The let-off is not advertised, but i would guess it’s 85% or more. You can hold this bow back forever with very little effort. In fact, letting down when the target window closes is almost scary. It defines what they mean when they say you have “push the release” to get the bow to let down.